Add a contemporary and functional presentation surface to your conference room or classroom with Quartet’s Magnetic Fabric Bulletin Board. Use push pins or magnets to secure documents to the attractive self-healing magnetic fabric surface. Backed by high-density fiberboard for extra durability. The aluminum frame adds an upscale, professional look to your board. Comes with hardware so you can easily mount to your wall. Quartet’s 3' high by 4' wide Magnetic Fabric Bulletin Board with Aluminum Frame is 100 percent customer satisfaction guaranteed. Note: This bulletin board can not ship to Canada. Add a contemporary and functional presentation surface to your conference room or classroom with Quartet’s Magnetic Fabric Bulletin Board. Use push pins or magnets to secure documents to the attractive self-healing magnetic fabric surface. Backed by high-density fiberboard for extra durability. The aluminum frame adds an upscale, professional look to your board. Comes with hardware so you can easily mount to your wall. Quartet’s 4' high by 6' wide Magnetic Fabric Bulletin Board with Aluminum Frame is 100 percent customer satisfaction guaranteed. Quartet's Magnetic Fabric Bulletin Boards with an Aluminum Frame add a contemporary and functional presentation surface to your conference room or classroom. Each board features an attractive, self-healing, magnetic fabric surface. High-density fiberboard backing provides extra durability. Comes with hardware so you can easily mount to your wall. 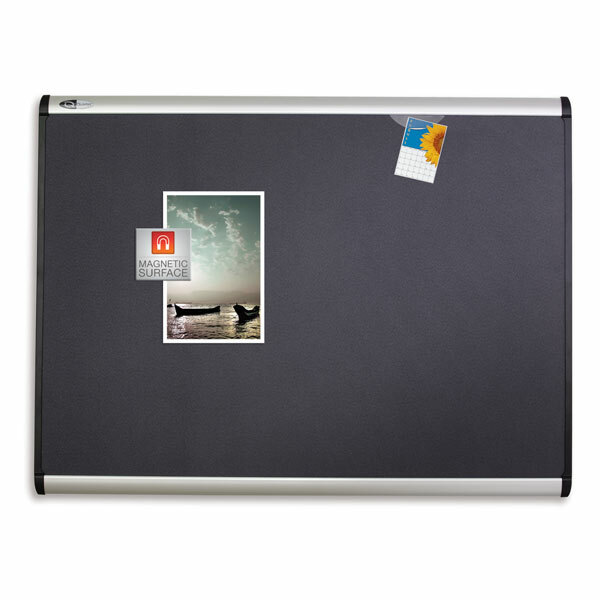 Quartet's Magnetic Fabric Bulletin Boards are 100 percent customer satisfaction guaranteed. Give our customer service team a call at (877) 839-3330 for assistance with your quote or order.